As a matter of fact, imagine your regular hard drive, but on steroids. SSD drives are very fast and reliable, but there are two major problems with them nowadays: Price and Size. SSD drives are pretty expensive in comparison to regular hard drives, and if that’s not enough, they are pretty small. A decent GB120 SSD costs USD99.99, while 1TB regular drive costs less than USD65. So when you have a SSD in your laptop, you gotta keep it tight with the space consumption. It’s very easy to run out of space with SSD. My SSD became almost full this week, so I had to clean it up a little bit. The best way to start cleaning up your hard drive, is by identifying fat folders, and start digging in. 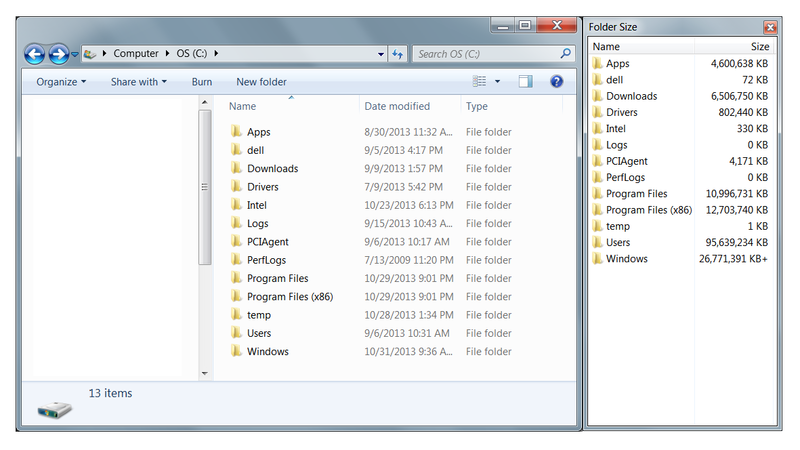 Back then, in Windows XP era, we were able to add the “folder size” column to the explorer window. For some reason, Microsoft decided to cancel this option with windows Vista, Windows 7 and 8. God knows why. I find this feature very important especially when you want to clean your hard drive, and you wanna know which are the biggest folders. So I found a small program called “Folder Size“. As simple as that. Folder Size shows sizes of folders seen in Explorer windows.